Click on the photo and see all the photos of Bonita vivenda com vista para o mar. Bonita vivenda com vista para o mar in Búzios offers accommodation with free WiFi, 3.7 km from Armação Beach. Housed in a building dating from 1993, this villa is a 17-minute walk from the Geriba Lagoon. The villa includes a kitchen with an oven and a microwave, as well as a coffee machine. The bathroom is equipped with a shower. The villa offers an outdoor pool. 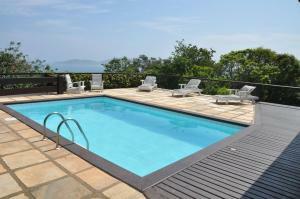 A barbecue can be found at Bonita vivenda com vista para o mar, along with a garden. Ferradura Lagoon is 2.1 km from the accommodation. Please inform Bonita vivenda com vista para o mar in advance of your expected arrival time. You can use the Special Requests box when booking, or contact the property directly with the contact details provided in your confirmation. This property will not accommodate hen, stag or similar parties. A damage deposit of BRL 350 is required on arrival. This will be collected as a cash payment. You should be reimbursed on check-out. Your deposit will be refunded in full in cash, subject to an inspection of the property.